Unless someone can prove to me that the unborn is not a human being in moral terms, scientific terms and philosophical terms then being pro-choice is nothing short of a massive practice of narcissism. To hear a liberal argue that the mother has the right to “terminate her pregnancy” is everything must of narcissistic behavior. I will not and cannot accept the horrific argument that abortion is okay because every child that is born has to be loved by the mother. 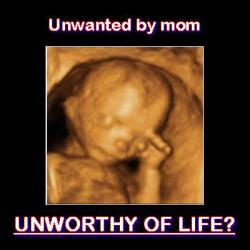 It’s narcissistic to say that your right to life is not granted if your mother doesn't love or want you. It’s simply wrong. Even when I was pro-Choice I found that argument to be cruel and venomous. Who cares if a human being has to die in the name of women's empowerment? They think forcing birth would inaugurate some kind of slippery slope. But that attitude won't.